A month after the iPad app launched, Square’s iPhone app is now generally available to users in the App Store. You can download the free app here. Founded by Jack Dorsey, Square was unveiled last December as an innovative way to let people quickly and easily accept physical credit card payments from their mobile phone. This works by way of a tiny card reader that plugs into the headphone jack on the device. It takes finger signatures on the touchscreen, generates email or SMS receipts, calculates sales tax, and comes with an online accounting dashboard to keep track of sales. (You can watch our video of how the iPhone app works). Square was originally designed for the iPhone and the company has been testing the app over the past few months with limited users, especially making sure the app is secure when it comes to protecting the financial information of users. We were told last week that the external credit card readers will begin shipping out as soon the app is live in the App Store. Square is sending them out for free to anyone who signs up for an account. Now that Square is available to everyone, it should be interesting to see how widely the mobile payments app and service is used. We’ve already seen some compelling use cases for Square, which faces competition from VeriFone’s mobile payments offering. 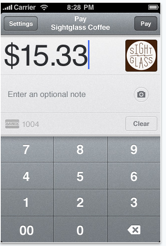 Valued at $40 million even before launch, Square has been off to am impressive start. And startup has a number of notable investors. Twitter co-founder Biz Stone, investor Ron Conway, Google’s Marissa Mayer, Foursquare co-founder Dennis Crowley, Digg creator Kevin Rose, investor Esther Dyson and a host of others have invested in Square. The company also raised funding from Khosla Ventures.